Anna Freud was the Sloan Visiting Professor at the Menninger Foundation in Topeka, Kansas, in 1962. She was a psychoanalyst and Sigmund Freud's daughter. In the first image, Dr. Karl Menninger is in the middle of the photograph. 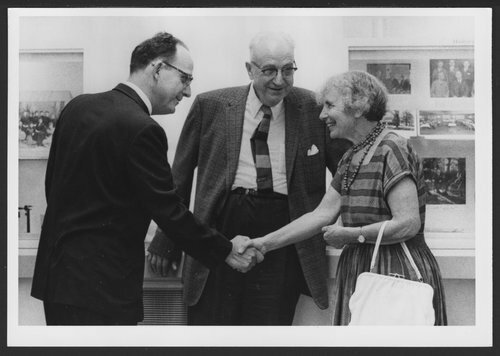 Anna Freud and Dr. Karl Menninger and Dr. Bob Menninger - Anna Freud greeting Dr. Karl and his son Dr. Robert Menninger.